I had to write about this as it was a pretty amazing experience, My Son and his girlfriend were visiting for the weekend and after months of being nagged I finally gave in and let him in the loft ! He has been bugging for a while as there was an old Dansette record player up there and a suitcase of my old records. In truth, I failed to see why these were of any interest to him. I am so glad I conceeded, it was a complete eye opener for me.............they had never seen one before let alone played with one lol. How funny that the things we take for granted as being part of our normal youth, are in this age of super duper clever technology, NEW to the kids ! It was truly fascinating to me to watch them not know how to use a record player, imagine not knowing what the stylus was, the arm was, the switch to 45 was ? and the little pop out centres ? It seriously tickled me, and took me way way back to the day before ipods, pads, bluetooth etc, the days of trying to record the latest tunes from a radio and clicking off before the DJ started talking lol. The days when you were so excited to buy the latest single that you left the arm of the record player back......so it would repeat and repeat...........talk about Auto play ha ha we hadn't even heard of it. 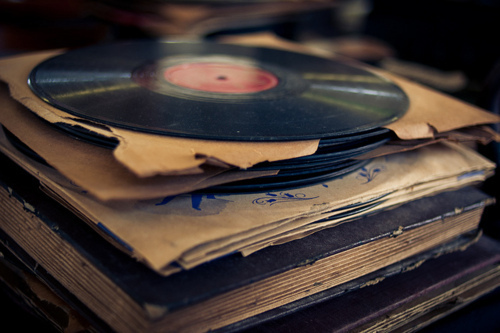 The days when you piled so many singles on that they would slide making the sound really freaky, blowing the fluff off the needle..........anyone with me here ? Along with his super new toy came a very battered old brown suitcase with no zip in sight, My almost daughter in law was so excited and claimed it was vintage lol, bless, she is a photographer and will use it as a trendy prop. Inside said vintage case was the library of my misspent youth, the best of it was I didn't need to feel any shame as they hadn't heard of 99% of the artists. 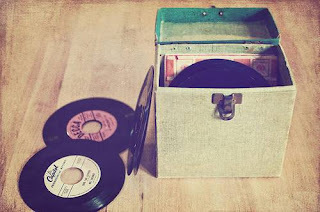 My old Motown, Soul, Reggae. Although I did do a little inner cringe lol. It was truly lovely that they got so much pleasure out of something I hadn't given a second thought to, and on reflection I could of got some serious payback on the rolled eyes when mumma cannot figure out something technical that is * the latest thang*......... and god Mum you are so useless hardy ha ha.............can you make a flower pot out of an old album ? NO ? well who's useless now ? On a serious note, it was a joy to watch, and I am so so happy that something so simple gave them so much pleasure. would love your thoughts and comments on " the good old days " were they ? or do we just have rose coloured glasses ?